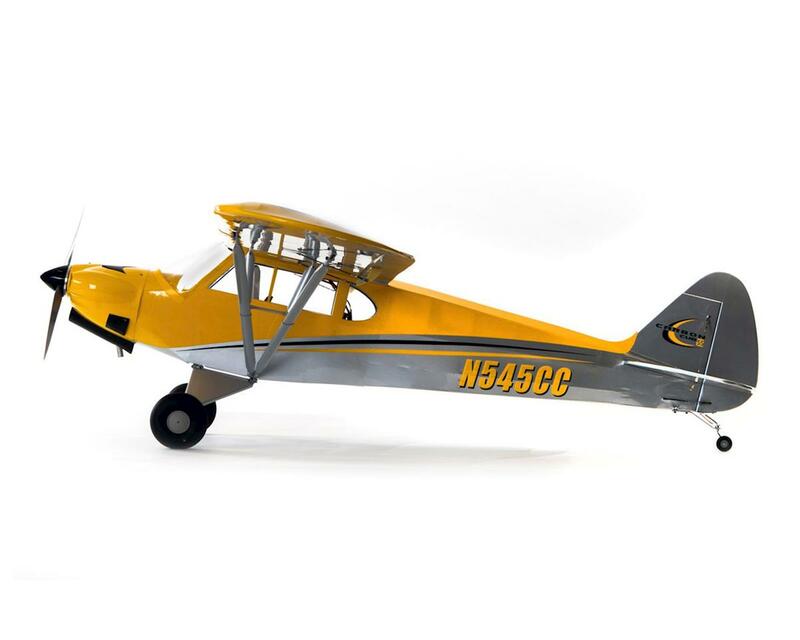 The Hangar 9 Carbon Cub 15cc ARF brings the heritage and versatility of the full scale airplane to life with a modern all-wood model that combines classic looks with a higher performance spirit. Featuring a 90-inch wingspan, this large model delivers the experience of giant scale, yet is practical enough to fly every day. The two-piece wing allows for convenient transportation and the quick-connect struts make assembly simple. 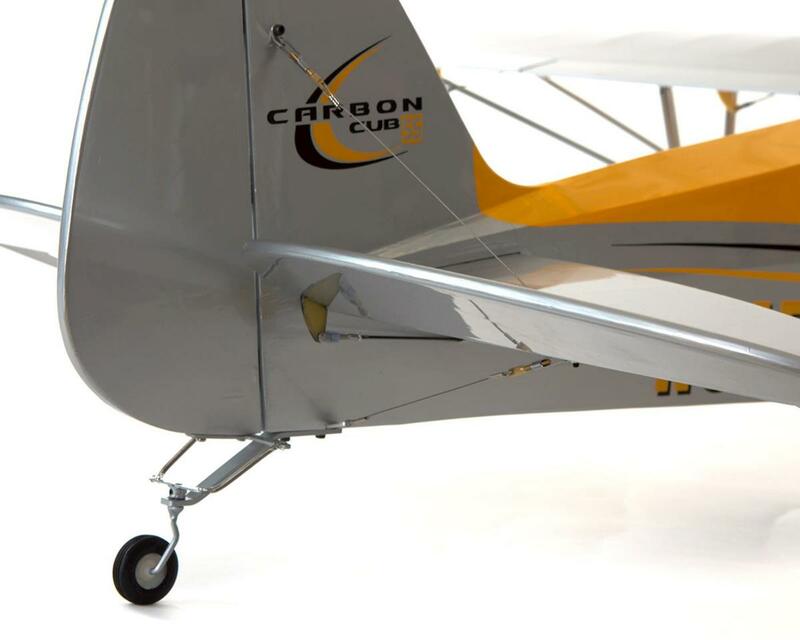 Scale detail like cockpit doors, interior features, landing lights and a scale spinner mean that this Carbon Cub model will easily turn heads at the field. 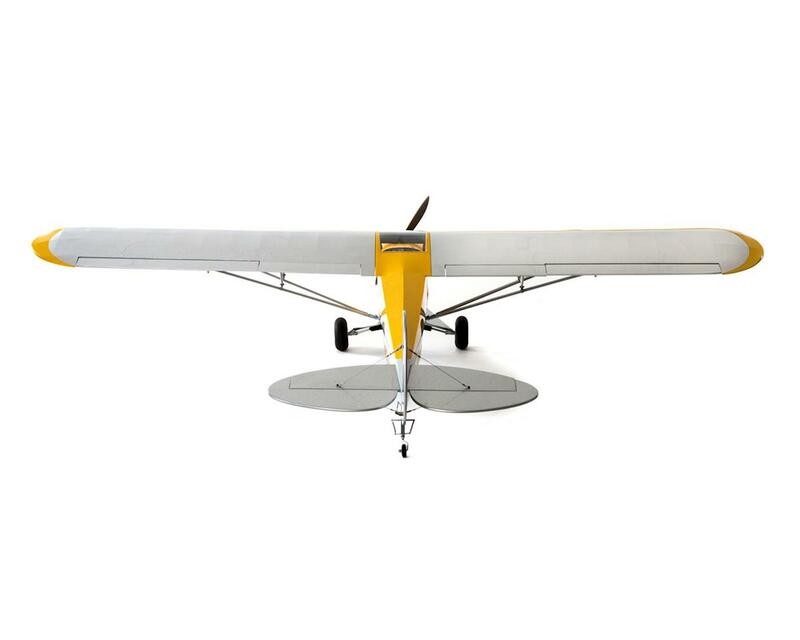 A light wing loading plus functional flaps help you perform impressive short takeoff and landings. Like the full-size, shock-absorbing landing gear take most of the bounce out of grass strips. With the optional 1/5-scale float set (sold separately) you can enjoy the same adventure-driven performance at the local lake. The Cub is a classic aircraft that’s adored by both full-scale and model aviation pilots. Its flying qualities and design versatility have come to be known well enough that practically every new aircraft is compared to it. That’s a lot to be said for an airplane that first flew in 1938. Cub Crafters of Yakima, Washington started their booming business by restoring original Cub airframes. Very quickly, the collection of engineered refinements spawned a brand new line of aircraft like the Carbon Cub that honors the original icon yet delivers performance that’s every pilot’s dream. Get fuel efficiency and gas engine ease-of-operation when you choose the Evolution® 15GX engine for this Carbon Cub. Its pumped carburetor design allows fuel to flow consistently regardless of fuel tank location or aircraft attitude while flying. Evolution Small Block gas engines offer lightweight construction and standard beam-mount installation like a glow engine. But what sets this engine truly apart from the glow-fueled counterparts is the phenomenal fuel efficiency. On average, it takes only 30% of the gas/petrol to provide the same run time as a comparably sized glow engine. That’s an amazing efficiency level that results in a cost per flight savings of approximately 90%. 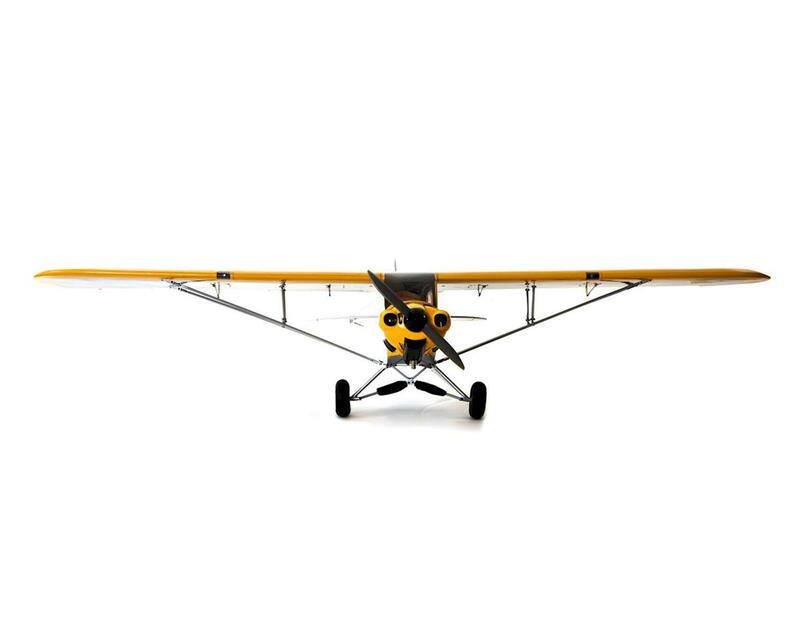 When you go to choose a transmitter, receiver and servos required for a quality airplane like this Hangar 9 Carbon Cub 15cc model, consider all the advantages genuine Spektrum™ technology gives you. Not only will you possess a proven radio system at a great price, you’ll get the safety benefits that only ModelMatch and SmartSafe features can give. Shock Absorbing Landing Gear: This working recreation of the bungee landing gear used on the full-scale Carbon Cub will soak up bumps during ground operations just like the real thing. 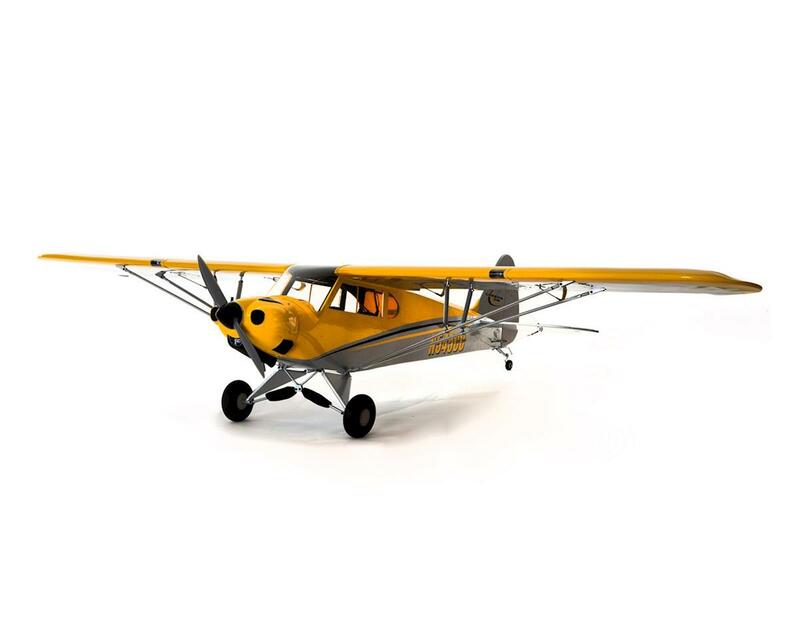 All-Wood Construction: Lightweight, laser-cut construction is utilized to bring the Carbon Cub 15cc to life as a durable scale model that’s built to last with a level of rigidity that makes even a friendly flying airplane such as this crisp control response. 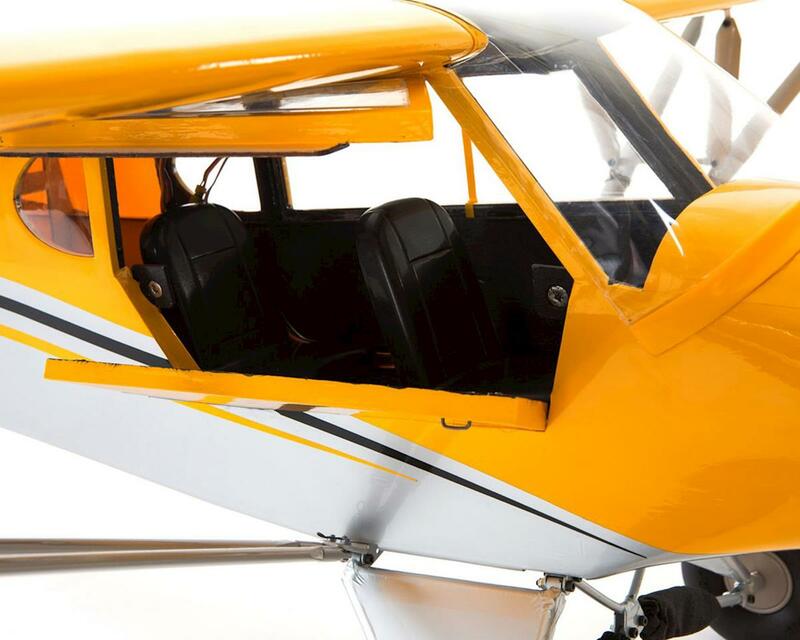 Genuine UltraCote Covering: The all-wood structure of the Carbon Cub 15cc is covered with genuine Hangar 9 UltraCote® film that provides a durable and easy-to-maintain finish that closely replicates its full-scale cousin. Gas or Electric: No matter what type of power you favor—gas/petrol, glow or electric, hardware and mounting options are included to suit a variety of power systems so you can be in the air in less time. Quick-Connect Wing Struts: The streamlined wing struts feature quick-connect strut pins so that only basic tools are needed at the field. Functional Flaps: The functional flaps allow you to enjoy the same short-field takeoff and landing performance that full-scale Carbon Cub pilots do. Landing Lights: The wings feature factory installed wiring and LED lights so that making a working landing light system is easy. Cockpit Doors: The magnetically secured cockpit door can be left open during flight, just like on the full-scale version. It also lets you keep switches out of sight by mounting them inside the cockpit. Float Ready: Hard points for mounting the Hangar 9 1/5-scale float kit (HAN6030—sold separately) are already built into the fuselage.